Voters line up to cast ballots at the Iowa City/Johnson County Senior Center on Nov. 8, 2016. Iowa voters avoided on Election Day 2016 many of the polling problems of possible disruption or lines so long that voting would be difficult that had been forecast, county auditors from across the state said. “We’ve not had anybody who’s trying to influence anybody,” Wayne County Auditor Sue Ruble said during the day. No one was campaigning outside polling places and or acting as a poll watcher, she said. Donald Trump had called on people to serve as poll watchers, to ensure a fair election. Ruble said a few people who had not registered to vote before Tuesday received help from poll workers under Iowa’s same-day registration provisions. People were waiting in line at 7 a.m. in Wayne County and there was a big rush was from 7 to 8 a.m., Ruble said. Counties scaled by total vote, color-coded by winning candidate. One problem many counties experienced was long lines in what some auditors were calling a record turnout, county auditors IowaWatch interviewed said Tuesday. 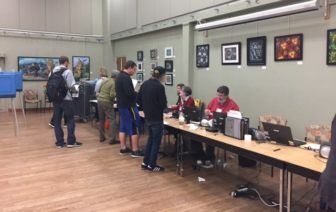 “This is a very big election and lots of young voters have been turning out, so it’s great to see people participating,” Calhoun County Auditor Judy Howrey said. Howrey said she was happy with how many millennial voters turned out for this election. A Vote Here sign leads voters to a polling place in Iowa City on Nov. 8, 2016. Chickasaw County’s three contested county supervisor seats had voters waiting at 7 a.m., and the lines continued all day, County Auditor Joan Knoll said. “What we’ve done is pull in the chairs and let them sit down,” she said. 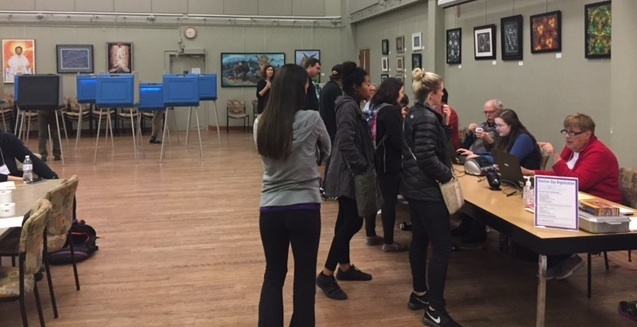 Butler County had a busy evening after numbers showed half of the county’s registered voters had voted by 3 p.m. “Our rush time was around 5 p.m.,” County Auditor Liz Williams said. In Cerro Gordo County, authorities called police about a person yelling at voters outside of a polling place, Auditor Ken Kline said. Mason City Police said the unidentified man was gone when they arrived. Kline said the rest of the day went smoothly in his north-central Iowa county after a ballot scanner initially didn’t work at one precinct in the morning and lines were manageable. “A wait of five minutes is a long wait for us,” he said Tuesday night. The Mason City incident aside, the overarching story from one county to the next was the lack of major disruption. “Pretty boring down here,” Howard County Auditor Julie Chapman said. “We got, got out, we were done,” voter Zack Werner, 19, a member specialist at Humach from Dubuque. His pick was Hillary Clinton, said. Voters at the Iowa City/Johnson County Senior Center in Iowa City, Iowa, on Nov. 8, 2016. However, at least one person struggled to get a vote in under the wire as polls closed at 9 p.m.
That person tried to register in Iowa City at her polling place and struggled to find her documents before the poll closed. She ended up being unable to vote because she couldn’t find the required paperwork. She declined to talk with an IowaWatch reporter about the matter. Another person with whom IowaWatch spoke also struggled with same-day registration. Plenty of Iowans avoided Tuesday’s lines by voting early. The Iowa Secretary of State’s office reported that 646,569 had cast absentee ballots early going into the day. Another 42,215 that had been sent still were to be returned, the office reported. Absentee ballots must arrive at the local county auditor’s office by 5 p.m. Friday to be counted. Tuesday’s votes are unofficial, pending canvasses in all 99 Iowa counties. “We did have a record of absentee ballots,” Winneshiek County Auditor Benjamin Steines said. At the start of the day 6,428 county residents had voted early via absentee ballot and a few more had arrived during the day. That’s up from 5,884 last year, Steines said. Iowa, with six electoral votes for president, had 2 million active registered voters going into Election Day. Of those, 694,005 registered under no party, 662,167 registered as Republicans and 629,081 registered as Democrats. IowaWatch staffers Krista Johnson, Noelle Alkhawaja, Tyler McClelland, Allison Bradley, Madison Peterson, Julian Sanchez and Lyle Muller; University of Northern Iowa student journalist Josh Dausener; and Buena Vista University student journalists Mackenzie Rappe and Jasmine Bautista contributed to this report. 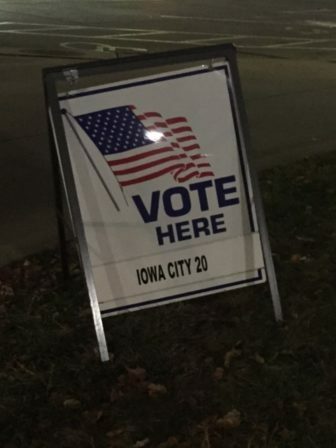 Polls were busy going into the evening hours in Iowa without disruptions that some county auditors feared might happen, an IowaWatch check of some counties this afternoon shows. Other county auditors have reported similar stories. 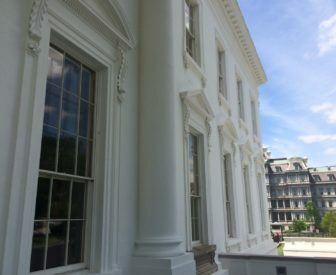 The Executive Office Building is seen next to the White House in this photo taken May 20, 2016. Voters were deciding whether Republican Donald Trump or Democrat Hillary Clinton moves into the White House in January as the next U.S. president. “I am actually surprised that we haven’t seen as many people as we have in the past at the polls, but I am hoping that it picks up later,” Appanoose County Auditor Linda Demry said mid-afternoon, around 4 o’clock. “We’ve not had anybody who’s trying to influence anybody,” Wayne County Auditor Sue Ruble said. No one is campaigning outside polling places and no one has been acting as a poll watcher, she said. No issues, Harrison County Auditor Susan Bonham said. Steady flow, pretty boring here, Howard County Auditor Julie Chapman said. Chickasaw County’s three contested county supervisor seats had voters waiting at 7 a.m. and the lines didn’t let up, County Auditor Joan Knoll said. “What we’ve done is pull in the chairs and let them sit down,” she said.